This weekend, the public will mourn a site of loss, recasting the painful memories and haunting fears that still hover over the aftermath at Ground Zero. But the people who worked and breathed that tragedy in the days and months following September 11 won’t be at the primary commemoration ceremony for the families of victims. The Mayor’s decision to limit the attendees by excluding the 9/11 first responders is an unnerving metaphor for an unhealed scar of 9/11. 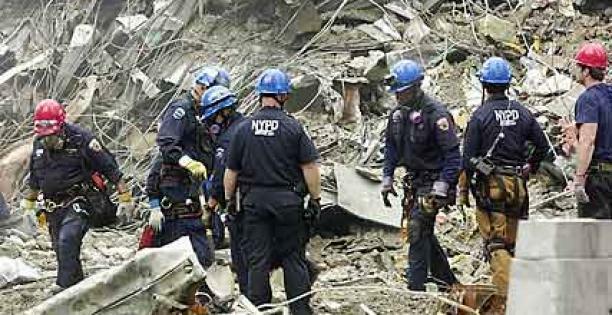 Many of the rescue and recovery workers who labored at Ground Zero have been plagued by a metastasizing medical crisis, aggravated by chronic political failure. This week, 9/11 firefighters and police chiefs rallied to demand changes to the rules governing compensation for health problems tied to poisonous air and debris at Ground Zero. They want federal funds to support treatment for cancer, which is currently omitted from the primary legislation covering Ground Zero-related medical needs. For years, researchers have been uncovering fresh evidence of widespread and devastating illnesses afflicting a large portion of people exposed to the aftermath; ongoing health issues range from crippling lung and breathing problems to post-traumatic stress disorder. But adequate funding for 9/11 workers has often been ensnared in political gridlock, not to mention the general incompetence of the healthcare system. Cancer treatment has been specifically excluded from federal health funding, with officials arguing there has been insufficient evidence to prove any direct link between the toxins present at the site and the disease. But last week the results of the first large-scale study, published in the Lancet, found that firefighters who were involved on the day of the attacks and in the weeks that followed had a 19 percent higher risk of contracting cancer. The study looked at 9,800 male firefighters, comparing those present during and after the attacks with those who were not involved. Beyond the study’s findings, there’s disturbing anecdotal evidence of cancer and various other problems, like gastric ailments and the inflammatory disease sarcoidosis. No one knows what the long-term effects are, but whatever the fate of these responders, there are about 15,000 people currently receiving treatment who will need answers soon. “We were literally chewing on that stuff,” said Firefighter Rob Angelone. Manetta remained “on the pile” for the rest of the day, as the FDNY implemented 24-hour shifts to staff the rescue and recovery operation, with nothing to protect his lungs from the intake of pulverized cement, glass, asbestos, and lead, among other aerosolized particles, as well as toxic fumes from burning jet fuel. According to Angelone, who returned to Ground Zero no more than ten times, Manetta was there “more than the average” firefighter…. Years later, a bump on Richie’s upper thigh — initially thought to be a hernia — was revealed to be a malignant tumor. The cancer spread to his testicles, lungs, and brain…. Manetta died within five days of two other Ground Zero workers with similar afflictions — New York police officers Robert Grossman, 44, and Corey Diaz, 37. New York Representative Carolyn Maloney, who helped shepherd the Zadroga Act through Congress, said “the study provided enough solid evidence for cancer to be included on the list of eligible conditions for federal funding,” according to the WSJ, which could unlock some of the allotted $4.3 billion based on a provision for treating additional illnesses identified in new research. In July, federal officials declared there wasn’t yet enough evidence connecting Ground Zero toxins to cancers. The outrage that among Ground Zero emergency responders and volunteers is stoked by the belief — recently affirmed by a ProPublica investigation — that the government failed utterly to warn people in the area about the risks of the pollution, or to implement essential safety measures for workers at the site, like enforcing rules about protective gear. For thousands of workers, this anniversary of 9/11 is an especially deep measure of loss — not just the immediate loss of life but years of lost opportunities to make still-neglected victims whole. Though “never forget” is a common refrain these days, the reality is that the public will always fixate on selected memories of the tragedy, while the lessons not yet learned — about the government’s responsibility in times of crisis — are left buried in the dust. Nearly 3,000 people died at the World Trade Center on 9/11. But the list of victims keeps growing. Seventy-thousand men and women worked in the ruins at ground zero. Many now suffer from illnesses officially linked to the toxic smoke and dust, including respiratory and gastric diseases. CBS Evening News anchor Scott Pelley brought some of them together and found out that for them, 9/11 is a day that never ended. John Gallagher was a New York City fire captain on 9/11. He’s among thousands of ground zero workers being treated by the World Trade Center Health Project at the State University of New York, Stonybrook. Those illnesses include respiratory and gastric diseases such as gastro esophageal reflux, known as GERD. It was only this year the federal government guaranteed medical coverage for these diseases, but not coverage for cancer. Pelley asked if there is scientific doubt, then these people should have the benefit of the doubt. Fifteen-thousand ground zero workers are still being treated for chronic diseases.